In 1944, twenty-three-year-old Tess DeMello abruptly ends her engagement to the love of her life when she marries a mysterious stranger and moves to Hickory, North Carolina, a small town struggling with racial tension and the hardships imposed by World War II. Tess’s new husband, Henry Kraft, is a secretive man who often stays out all night and hides money from his new wife. Tess quickly realizes she’s trapped in a strange and loveless marriage with no way out. The people of Hickory love and respect Henry and see Tess as an outsider, treating her with suspicion and disdain. Tess suspects people are talking about her, plotting behind her back, and following her as she walks around town. What does everyone know about Henry that she does not? When a sudden polio epidemic strikes the town, the townspeople band together to build a polio hospital. Tess, who has a nursing degree, bucks Henry’s wishes and begins to work at the hospital, finding meaning in nursing the young victims. Yet at home, Henry’s actions grow more alarming by the day. As Tess works to save the lives of her patients, can she untangle her husband’s mysterious behavior and save her own life? 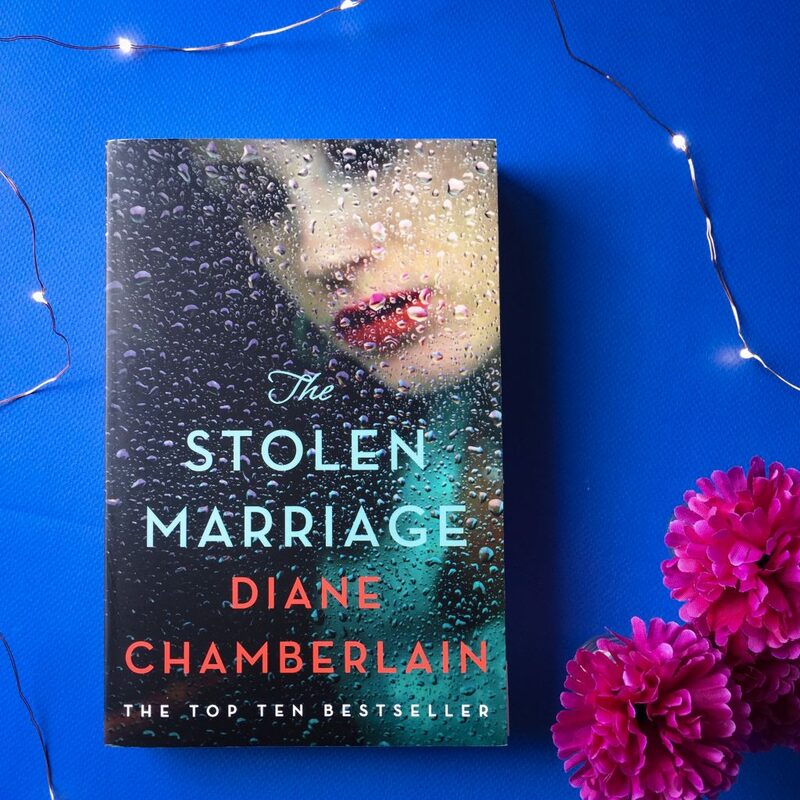 The Stolen Marriage by Diane Chamberlain is as heartbreaking as it is emotionally captivating. Steeped in history, this novel is beautifully written and so difficult to put down — I devoured it in one sitting because I was desperate to get to the end. There are so many twists in the plot, and each one was just as unpredictable and as thrilling as the last. Diane has written such three-dimensional, wondrous characters. They’re all flawed, but likeable, and I loved reading about them. At times, Tess felt really immature and a little clueless, but given that this book is set in 1944 and Tess is only twenty-three, you can forgive her for being a little slow at times. She certainly makes some decisions that could’ve been better thought through. Each and every character in the book, whether they appear in five chapters or fifteen, are well thought out and very well crafted. Diane has captured their dialogue and body language really well, showing us things about their personality through their actions and not telling us simply in the prose. The Stolen Marriage is filled with plenty of secrets and betrayals, but it also illustrates true love and the importance of sacrifice for the one you love. Tess leaves Vincent because of a terrible mistake and she wants to spare him the pain, and whilst it’s probably not the wisest decision, it does illustrate her love for him. Diane has captured what life was like in the deep American South in the 1940s, highlighting the gender and race issues of the time and prejudice against women working or a black person dating a white person. Diane has also captured the polio epidemic very accurately, illustrating the widespread fear but also the initial ignorance about how one catches it and how it is transmitted. Ultimately, this novel is about two characters attempting to pull themselves out of a difficult and complex situation. For one, it’s torture. For the other, it’s salvation. The novel is paced really well and the storyline and setting is really interesting. I read a lot of historical fiction novels and yet I felt like The Stolen Marriage was really unique and something I hadn’t come across before. “I woke to the sound of muffled voices on the other side of the bedroom door. It had to be nearly five o’clock, the room filled with a dusky twilight. “She doesn’t play bridge and I’m hardly going to put everyone in the bridge club through the agony of tutoring her,” Ruth said. I couldn’t hear Henry’s response, though his voice sounded calm. I recommend this to historical fiction readers, but also readers who love adult fiction. Yes, it’s embedded in history, but it’s a fantastic storyline filled with all different types of characters and friendships. I enjoyed this book a lot more than I thought I was going to, that’s for sure! Thank you to the publisher for sending me a review copy in exchange for an honest review.